In February, 2018 a very interesting four week experiment began in the desert in Oman. 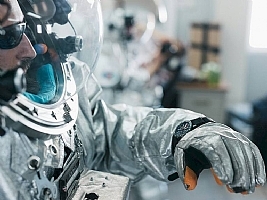 This project was a mission of the Austrian Space Forum (OeWF). This area was chosen for its similarities to Mars, and looks very familiar if you are a fan of Matt Damon. His starring role in the movie "Mars" was actually filmed in Wadi Rum in Jordan, on the opposite end of Saudi Arabia to Oman. 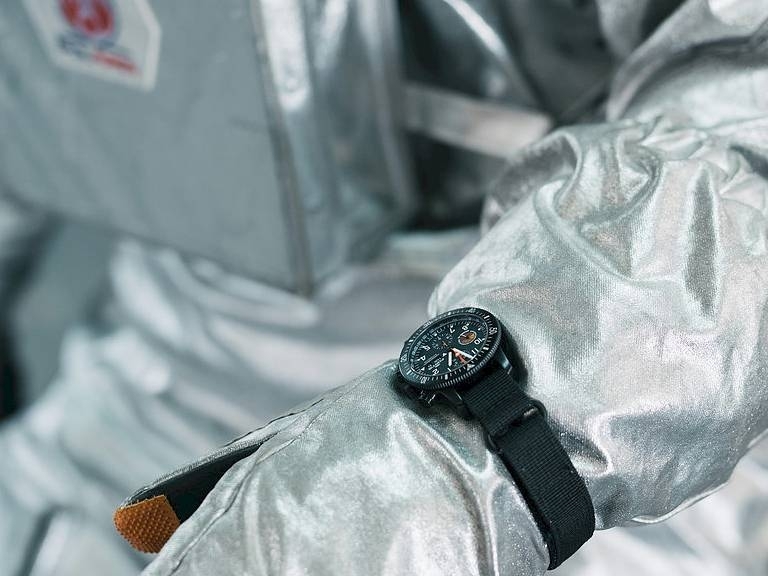 Because Fortis has considerable experience in building watches for space, the brand was a natural to be the official timekeeper throughout the project. Visit the official web site of AMADEE-18 to learn more about this project and to see pictures of the simulated Mars space stations that were built for this project. Once Fortis was selected to be the official timekeeper of this Mars simulation, they began building a watch based upon their most famous space watch - the Fortis Official Cosmonauts chronograph. The designers chose a black PVD/DLC B-42 case to house this new watch. The official logo of AMADEE-18 is located just under the sweep seconds hand at 9. The dial is matte black dial with contrasting white numerals and indices. This watch features complete chronograph functions along with a day and date display at 3. Oversized pushers provide for easy operation of all chronograph functions. This watch features the three traditional chronograph subdials: a 30 minute counter at 12, a 12 hour register at 6, and seconds at 9. The hands of both chronograph counters, as well as the central chronograph hand, are painted orange for easy identification. We are also impressed with the screwed case lugs, ensuring a secure fit at all times. This watch is fitted with a black Fortis performance strap which is integrated to leave no gap between the strap and the case. The buckle is a Fortis signed black PVD tang. This watch is also available in a "Mars Orange" Fortis silicone rubber strap with black compact butterfly clasp for those wanting to get a bit closer to the planet. 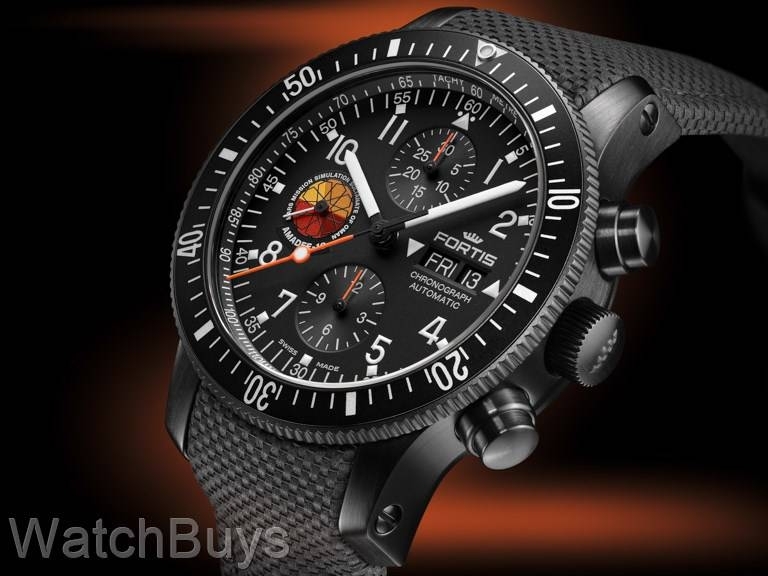 WatchBuys is proud to have been selected as the exclusive North American distributor for Fortis Swiss watches. Because we are the official and authorized North American Fortis distributor, your name and watch serial number will be automatically registered in our database for a genuine Fortis manufacturer's limited two year warranty which we pass through. Please be aware that most web sites advertising Fortis watches for sale are not authorized Fortis dealers but instead are selling grey market watches. Such watches may be used, refurbished, very old stock or worse and carry no factory warranty from Fortis. Further, Fortis has issued recent warnings about fake watches appearing on a number of auction web sites. We invite you to review the entire collection of Fortis watches, an important part of Swiss watch history since 1912.